In the backdrop of a transformed technological scenario, fewer fighter aircraft are needed to fight tomorrow’s wars. So cries of depleting fighter squadrons are a throwback to a bygone era. How many fighter squadrons does the Indian Air Force need to fight a war, and more importantly, win it? A senior IAF commander says the current fleet strength of 33 squadrons – approximately 600 aircraft – is not enough to fight a two-front war. The “sanctioned strength” is quoted at 42 squadrons and anything below this will impact national security. Where did this number come from? In the 1950s, the defence brass had recommended 64 fighter squadrons for the IAF. That was revised to 42 in the 1960s. There is nothing magical about this number and only those who fail to recognise that the nature of air combat has changed will cling to it. Back in the 1960s - when the supersonic era was in its infancy - jet fighters were smaller, accident prone, required longer maintenance hours and had low endurance. For instance, it was said about the MiG-21 that it was in a fuel crisis even as it took off. Because the MiG-21’s endurance was only 30-45 minutes, you needed more of them to ensure some aircraft were always in the air. Today’s Generation 4 and 4+ aircraft have long legs. The IAF’s Sukhoi Su-30MKI - codenamed Flanker by NATO - has a range of 3000 km on internal fuel, which ensures a 3.75 hour combat mission. 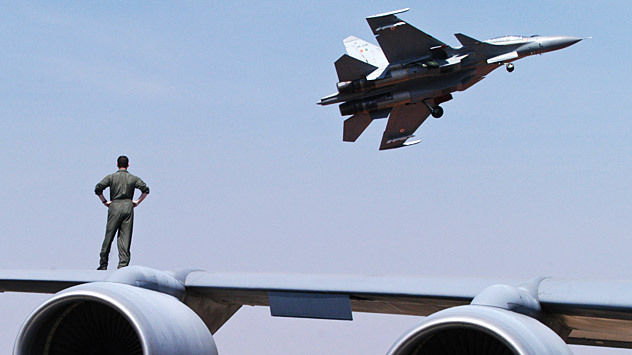 India’s Sukhoi pilots are known to have practised 10 hour missions during air combat exercises. With such long legs, the Sukhoi can runs laps around Pakistan’s perimeter. The Su-30s, MiG-29s and Mirage-2000s are versatile fighters that not only undertake strike and bombing missions, but can also provide combat air patrol (CAP) which creates a safe envelope for other jets to operate freely. Therefore, compared with previous generation aircraft, today you need fewer Generation 4 warplanes to get the same job done. Better survivability and lower maintenance also contribute to more aircraft being available for missions. The IAF has adopted the practical remedy of cranking up production of its Su-30MKI warhorse in response to mass retirement of older MiG-21s and MiG-27s. The final tally was initially set at 272 but now it seems the Flanker fleet will cross 300. With such numbers at its disposal, the IAF is now able to build a network of bases around the country. Earlier, because of the short range of IAF fighter aircraft, most Indian air bases - like Adampur, Pathankot, Jammu, Amritsar and Jodhpur - were close to the Pakistan border. But now Sukhois are also being stationed at places such as Thanjavur in the deep South, Chabua in the northeast, and Pune in western India. Because of its range and speed – 2120 km/h – the Sukhois can move between the Pakistan and China fronts quickly. Also, in the wars of the 1960s and 1970s, aircraft had to refuel and rearm after each mission. But a Sukhoi pilot can strike targets in Tibet and if he has rockets and bombs left, expend them against the Pakistan Air Force base in Sargodha and, as a bonus, attempt a BrahMos strike against a Pakistan Navy vessel off Karachi. In the next war, the Sukhois will make the Pakistani air defence look like Swiss cheese. With the arrival of cruise missiles, the nature of air power has changed considerably. While aerial deep penetration strikes involves risk to pilots, cruise missiles such as the BrahMos can lower the risk factor. The sudden and stealthy impact of missiles can be highly demoralising to the enemy, eroding his resolve. When waves of BrahMos missiles start thudding into their defences, tanks, air bases, ships, and command and communication centres, it will hasten a Pakistani capitulation. A saturation attack of supersonic cruise missiles may be cheaper than sending in expensive aircraft. A made in India ‘Flanker’ costs $75 million but a BrahMos missile costs a fraction of that. India has ordered a fourth BrahMos regiment. Each regiment is made up of four launch vehicles and 90 missiles and costs around $300 million. When you factor in zero risk to pilots, pinpoint accuracy and lower costs, then cruise missiles offer war planners a tantalising option compared with piloted jet fighters. This new development is not something the IAF, or any other air force, will particularly like. Nevertheless it is true that modern missiles and drones are beginning to crowd out traditional jet fighters away from combat zones. Pakistani aircraft trying to enter India will also have to reckon with India’s growing fleet of AWACS aircraft. India’s air defence network is of 1960s vintage from Russia, but don't forget that it was a 1960s Russian surface to air missile (SAM) fired by Serbian air defence that brought down an F-117 stealth jet of the US Air Force. Finally, is a two-front war likely? Yes, but only in the warped heads of Pakistani generals. Islamabad’s fantasy is that the Chinese will roll across the Himalayas into the Indian plains and New Delhi will accept defeat. However, if past wars are any indication, this will remain a fantasy. In the 1965 War, when Indian regiments crossed the Ichhogil Canal in Pakistan and were on the outskirts of Lahore, the Chinese sent India a strongly worded note accusing India of aggression in Tibet. After India denied it was acting aggressively on the China border, the Chinese said they were satisfied with the answer. End of story. During the 1971 War, China didn’t even move a truck despite US Secretary of State Henry Kissinger’s repeated requests to launch some kind of attack on India. Further, Russia had assured New Delhi that it would launch a massive attack against China if it opened the Himalayan front. The Chinese knew this and sat on the sidelines mutely watching India humiliate their client. Today India is a far bigger economy and has a much improved war fighting capacity. Defence analyst Khan writes in 'Air Power and Challengers to IAF' that in the event of a flashpoint with Pakistan, "its air power will be obliterated by the quality and quantity of air weapons India possesses". "With the present air power preparedness, India will have the capability to hit every single important military and economic target in Pakistan. And given Pakistan's size, each target there is ten times as valuable as an equivalent target in India. As far as Pakistani attack capability, it can only be minuscule. Pakistani air power will have an extremely difficult time protecting Pakistan skies. The token numbers available for attack can, if at all, get to targets only in western India." China is not an enemy country. It is an enemy that has been created by Lutyens Delhi - a class of Indians who are western in outlook and have inherited the undesirable traits, fears and biases of their British masters. China is a communist country only in name but at its core it is a Confucian/Buddhist country with close ties to ancient India. Moreover, China’s focus is the growing US menace in the Pacific. India barely appears within the bore-sight of Chinese strategic thinkers. Beijing has little to gain by attacking India or joining a Pakistani attack on India. (Assuming Islamabad has the stomach for a fight.) If India-China trade grinds to a halt, the biggest loser will be Beijing because the trade balance is heavily tilted in its favour. Also, in the unlikely scenario that China does attack India, then the Indian Navy will be a permanent presence in the South China Sea, which China considers its private domain. It will also kill the BRICS alliance, which would swing the global balance of power back in the West’s favour. This will be China’s worst nightmare. With India announcing in March 2016 that it would double the production of the Tejas light combat aircraft, the IAF can expect reinforcements in the medium to long term. In the meantime, the growing fleet of Sukhois - and the support cast of MiG-29s, Mirage 2000s and upgraded MiG-21s - are more than enough to defend the country and fight a prolonged war.